Colette Heirendt and Francis Massen visited the "TOP SECRET" exhibition on cryptography at the Mundaneum, Mons, Belgium (05April2018). See album. Colette Heirendt and Francis Massen visited the Bonami computer museum in Zwolle (NL); this is the largest computer museum in the Netherlands. Albums (4): the PONG collection, Miscellaneous, Personal Computers, Games. New album with 125 slides from the visit by Francis + Colette Massen-Heirendt of the famous Computer History Museum in Mountainview, California (30 Aug 2017). The CHM is the biggest computer museum in the USA. Take a look at it's excellent website. 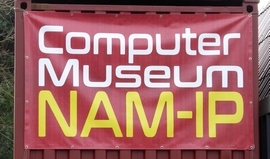 Colette Heirendt and Francis Massen visited the new computer museum NAM-IP in Namur Belgium. 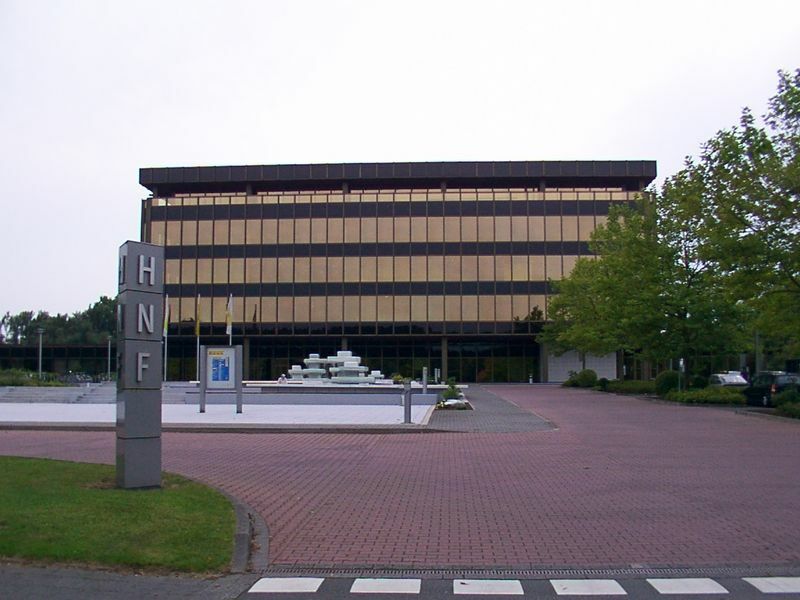 This is an outstanding museum which opened the 27 October 2016; it has a very nice collection of mainframes, big "pre-computer" card handling machines, one of the 4 existing Hollerith machines etc. A must to visit! See album. 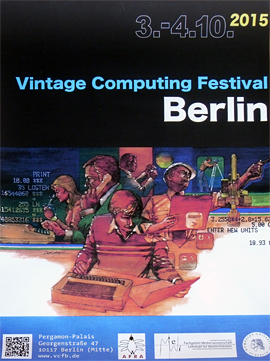 Colette Heirendt and Francis Massen participated to the Vintage Computing Festival 2015 organized at the Humboldt University in Berlin (www.vcfb.de). There was a small exhibition of vintage personal computers and also of some more professional computers, as the HP9845 desktop computers and several full blown PDP's from DEC in action. 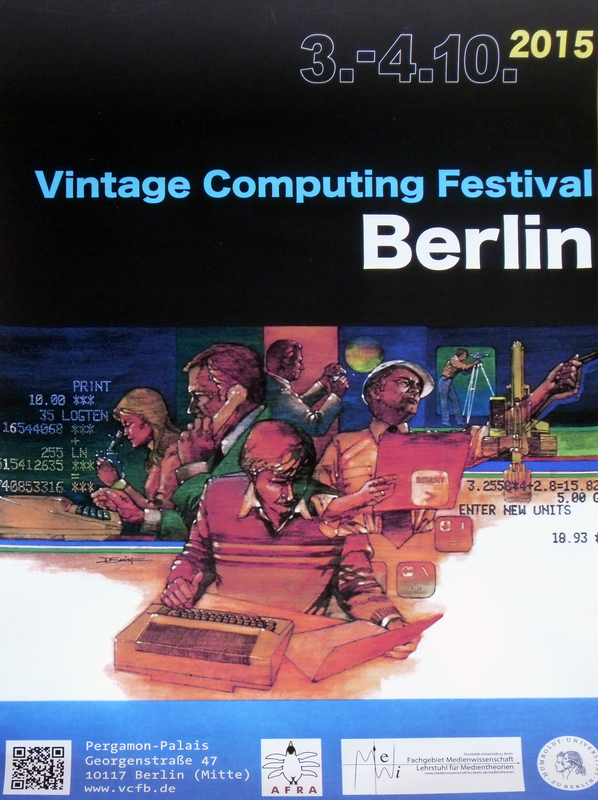 The main highlight was "Analog Computers" with a special exhibition of some very interesting items and two presentations on analog computing by Prof. Dr. Bernd Ulmann, who certainly is the best German specialist on analog computers. Look into the album ! Claude Baumann and his wife Anita made a visit to the Science Museum in London in April 2015, and brought back some pictures made from the exhibits. Can you find how many items shown are also in the Computarium's collection? (Hint: the liquid cooled CRAY-ONE is not among them!) . See album. Visit of the Bradbury Science Museum at Los Alamos, New Mexico (USA) by Colette Heirendt and Francis Massen, May 2014. 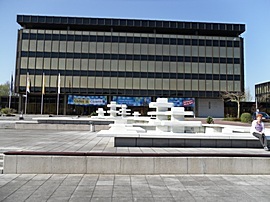 This museum relates the works of the scientists building the two atomic bombs during WWII; it has one vitrine dedicated to the calculators used during and after the Manhattan Project. See album. Visit of the Bletchley Park National Codes Centre and the TNMOC (The National Museum of Computers) at Bletchley Park, UK., by Colette Heirendt and Francis Massen the 20th June 2013. Bletchley Park, the home of the WWII code breakers comprises an old 19th century mansion, a number of wooden huts where the code breaking crews worked 24/24, and some mortar and brick buildings thought to be bomb proved. Some of the huts have been restored, others are waiting to be remade habitable again. Block B houses the most important part of the exhibitions, including a rebuilt of the BOMBE machine developed by Alan Turing for breaking the Enigma cypher. Block B houses also the greatest collection of different Enigma machines in the world. Rebuilds of the Tunny, Heat-Robinson and Colossus are exhibited in Block H. These machines were used for breaking the Lorenz SZ42 teleprinter cyphers. Look here for an album of the visit to the Bletchley Park National Codes Centre. The same block H also is home to the TNMOC. This computer museum is exceptional for its very large collection of mainframes (some in working order) and for several rebuilds or restorations of very ancient valve computers like the Harwell WITCH or the EDSAC (movies here). The museum is a bit overcrowded, and clearly in need for more storage room. Many of the smaller machines (mechanical or electronic) can also be found in our Computarium. Look here for an album of the visit to the TNMOC. As pictures had to be made without using the flash, the quality is not always very good, so please be tolerant! All photos by C. Heirendt and F. Massen. Click on the right logos to access the websites of the two museums. Visit of the Powerhouse Museum in Sydney by Colette Heirendt and Francis Massen. The Powerhouse Museum is a technical museum built in an old big power station that delivered electricity for running Sydney's tramways. The museum has a large collection of vintage calculators and computers, but we were disappointed to hear that these items are in storage and not on display. As there was an ongoing CYBERWORLD exposition, we visited this part of the museum (as well as the very impressive exhibition on steam power and steam machines). The album shows some pictures of the Cyberworld section. Lighting is very dim at this museum, what is a pity (and a curious decision for an electrical powerhouse! ), as many exhibits are quite difficult to see properly. I took pictures as usual with the iphone, which is rather good at working in low light conditions. Visit to Australia's first computer exhibited at the Melbourne Museum. The 10th November 2012, Colette Heirendt, Florence and Francis Massen visited the CSIRAC computer, which was Australia's first computer, built in 1949 by young English physicist Trevor Pearcey and electronician Maston Beard. CSIRAC is apparently the only remaining complete computer from the era of the first valve driven computers with stored programs (as was the ENIAC). It operated from 1949 to 1956 at Sydney University, from 1956 to 1964 at Melbourne University, and was the last and longest working of these dynosaurs. Click for a short album. 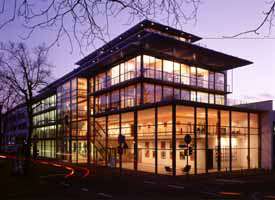 The computer is exhibited behind a glass enclosure, so the quality of the pictures made using an iphone by F. Massen is not breathtaking. A very interesting book by Doug McCann and Peter Thorne "The Last of the First" on the history of this computer will be added to the Computarium library. The 13th May 2011 RTL TV brought during the evening news a reportage for the 70th anniversary of the ZUSE Z3 computer (based on electromechanical relays). The 11th May, a journalist and camera man from RTL TV visited the Computarium to take some video shots and make a short interview with F. Massen. The Computer Science department of this private university held a colloquium the 10 Dec 2010 to commemorate the 40 years of the start of this department. 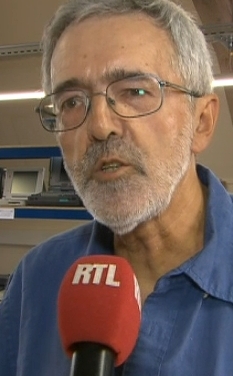 The theme was "Programmer: un passé pour l'avenir?" (Programming: the past for the future?). Click on the link for the abstracts. Colette Heirendt, Francis and Florence Massen participated, and were glad to hear 6 exposés on very different subjects: A long history of programming (M. d'Udekem-Gevers), The first Belgium computer built by Philips/MBLE (J. Loeckx), Algol and Cobol teaching at the start of the computer department (F. Bodart), Dijkstra and structural programming (P.A. de Marnette), Prolog and the Japanese 5th generation computers (Y. Willems), The history of concurrent programming (J.M. Jacquet). Even if some exposés were sometimes a bit dense, we much enjoyed this interesting meeting, whose principal organizer was Marie d'Udekem-Gevers, to whom we talked briefly about our Computarium. HNF (Heinz Nixdorf Museums Forum): I spent a weekend in April 2010 with Colette Heirendt in Paderborn, visiting this outstanding, greatest museum of computers and related machinery. Here is an album with selected pictures. 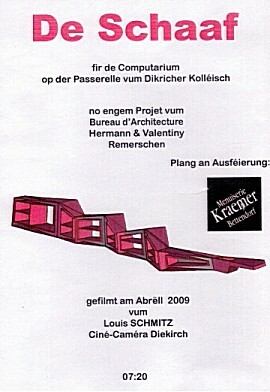 VIDEO (7 minutes, 85MB, mp4) of the "making of" the extremely complicated Computarium showcase built by Menuiserie Kraemer. 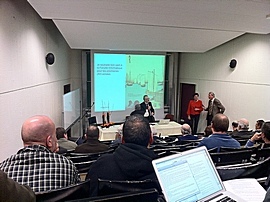 Photos by F. Massen taken with a smartphone, low quality pictures.